I really like that. Love the colors and the thoughtful yet adventurous mood. Beautiful colors, and beautiful light! I'd chase after that moon, too. Or maybe his hero is Stuart Little? Very nice moonlight - especially the reflections on the water. This is really super! I like your concept and your technique. The scale given by the cattails is great. Great feel to this one, and wonderful lighting. Hey... I grew up in Utah. This is a lovely piece. I really like the glow from the moon. 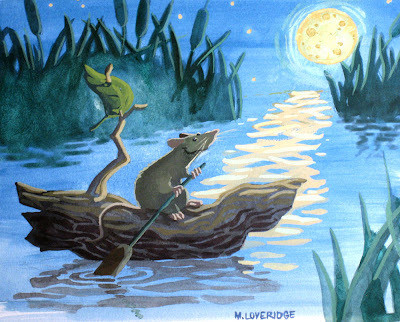 I really enjoy painting mice too. I love the light reflecting on the water. I love the colors and mood it sets. It's just that mice frighten me! Wonderful illustration, though! What a romantic moon and lovely picture. He is going home to his girlfriend I think ,he looks so happy! Someone said my moon looks like it is made of cheese. I love your illustration. I see a great story line here. Cute story you may not want to hear... my four-year old saw a huge picture of swiss cheese at the grocery store and she kept saying, "SpongeBob." It took me forever to figure it out. I love the limited colors and the magical feel! really lovely - evokes a lot of emotion as well.